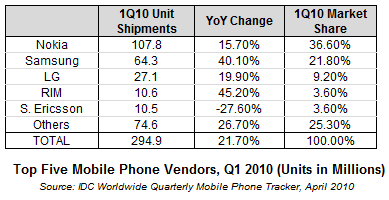 The worldwide mobile phone market grew 21.7 percent in the first quarter of 2010, according to new figures from IDC. Vendors shipped 294.9 million units in the first quarter of 2010 compared to 242.4 million units in the first quarter of last year, which had seen a 16.6 percent year-on-year decline. IDC attributed the growth to increasing demand for smartphones and the global economic recovery. Growing demand for smartphones also helped BlackBerry-maker Research In Motion (RIM) move into the top 5 vendor rankings for the first time, replacing Motorola and tied with Sony Ericsson at fourth place. This is also the first time Motorola has dropped out of the top 5. The entrance of RIM into the top 5 underscores the sustained smartphone growth trend that is driving the global mobile phone market recovery. Though Nokia is ahead by a huge margin in position No.1, Samsung, the world’s second-largest handset vendor shipped 64.3 million mobile phones in the first quarter, up 40 percent from a year ago, is hot on the heel of Nokia. What is worrying for Nokia is while Nokia is KING when comes to number of devices sold, Nokia is lagging in the sales of Smartphones as their market share had continued to drop quarter by quarter and their latest flagship model, the N8 hasnt been getting good review.